Forum Waterptc → Waterptc News and Information → Waterptc News and Announcements → ID Verification! =>We found that there are many Fake Members(Scammers) in Waterptc who are working and requesting withdraws and try to damage Waterptc which is not tolerable. So, The Administration of Waterptc decides to do ID Verification of the members who are Non-Depositors or Waterdrop(Standard) Membership holders before paying them. So, In order to give payments to each and every Genuine Member and suspend Fake(Scammer) Member, we must need ID Verification Process. =>Non-Depositors or Waterdrop(Standard) Membership holders must need to go through this ID Verification Process as soon as they request their first Payment/Withdraw/Payout/Cashout. 1). Members have Pending Payments who are Non-Depositors or Waterdrop(Standard) Membership holder, then they also need to Submit their Documents Accepted in ID Verification Process. 2). Depositors also need to Verify their Waterptc Accounts through ID Verification Process as soon as their Total Payment Received Amount will Exceed the Total Deposited Amount. => For Example:- i). If a member Totally Deposited $1000 and Totally Received $1000, then the ID Verification is compulsory as soon as they request their "Next Payment" after Totally Received $1000 within 30 Days from the date of that "Next Payment". ii). If a member Totally Deposited $1000 and Totally Received $990 and has "Pending Payment of $50", then the ID Verification is Compulsory within the 30 Days from the date of that "Pending Payment of $50". 3). We can also ask Depositors or Upgraded Members to go through this ID Verification Process before their Total Payment Received Amount will Exceed the Total Deposited Amount at any time, only if we found any doubtful activity in their Waterptc Account. 1). If the Non-Depositors or Waterdrop(Standard) Membership holders failed to Submit their Acceptable Documents for ID Verification Process within 30 Days from their Pending Payment Date, then their Waterptc Account will be Suspended without any notice. 2). 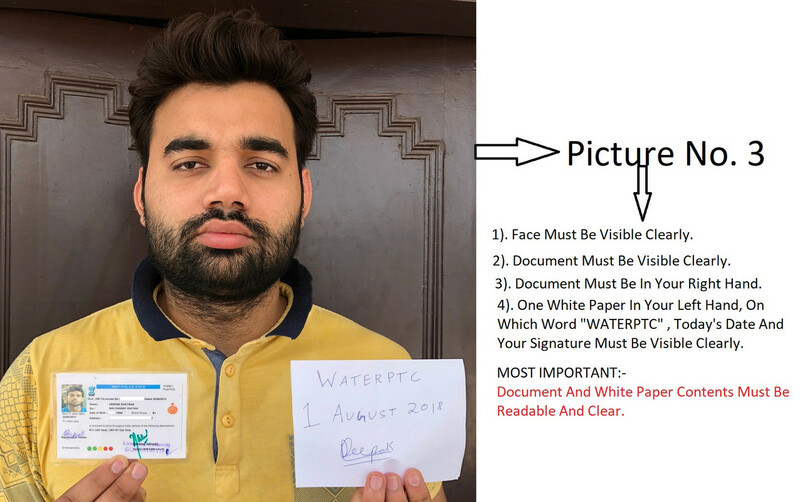 If the Non-Depositors or Waterdrop(Standard) Membership holders who have Pending Payments failed to Submit their Acceptable Documents for ID Verification Process within 30 Days from 1st August 2018, then their Waterptc Account will be Suspended without any notice. 3). If Depositors also failed to submit their Acceptable Documents for ID Verification Process within 30 Days from the date of their very Next Pending Payment after their Total Payment Received Amount will Exceed the Total Deposited Amount, then their Waterptc Account will be Suspended without any notice. 1). The document must be valid please double-check expiration date. 2). The document must be issued by a government. 3). The Full Name of your Waterptc Account must match with your Document's Full Name. 4). The document must show a photo of your face clearly. 5). The document must have a high resolution and high quality. 6). You need to Send both sides (front and back) of your Documents without any Editing or use of any Graphic Editor. 7). If we found the same documents submitted for 2 or more accounts, then we will suspend those accounts. We hide a few details in the above documents for security reasons because we are posting Documents of Admin in Waterptc Forum to set up an example for our Members how they need to send Mail with Documents for ID Verification Process and Waterptc Forum is a Public Forum where everyone is allowed to visit and we don't want to spread Details of Admin Publically. So, You all must send your Documents and Details in the mail only not in Waterptc Forum or Support Tickets. =>We believe that the legit members of Waterptc will cooperate with us to stop the scammers who are damaging the Waterptc. As we are here for the lifetime, so, we want to work with you for the lifetime which only could be possible by blocking the scammers. Hello Admin...Hope U R Gud!!! Admin, no comment Well, good luck, your bux removed from my site. Who told you that asking for ID or Passport is illegal? We are asking for ID or Passport to validate genuinity of the Waterptc Members and remove scammers from Waterptc and from our PTC World. Bulgarian laws,translate if is possible.